Speaking of the "Hudson River School" of anime, that casts the Japanese countryside in the best possible light even as it slowly fades away, Non Non Biyori perhaps epitomizes the genre. Hotaru arrives in a farming community, having moved with her parents from far-away of Tokyo. Her first day of school, she discovers that the building (probably built at the peak of Japan's baby boom in the 1960s) has one classroom and five students. The Hokkaido elementary school in The Wolf Children manages about five kids per grade. This school has five kids total. And the building is slowly disintegrating around them. Non Non Biyori studiously avoids unpleasant economic facts like the number of rural communities going bankrupt and disincorporating, the abandoned civic infrastructure inexorably crumbling to pieces. The Japanese government shovels out farm subsidies 100 times (on a per capita basis) more generous than the U.S. government. Communities that hang onto their farmers survive. That's getting harder and harder to do, and soon there won't be any farmers left. That hasn't happened yet in Non Non Biyori. The story is told from a kid's point of view, and these kids have never been to the "big city" (except Hotaru) and so have nothing to be cynical about. Rather, the focus is on what a bunch of quirky kids do in a town where there's very little to do, at least by modern, suburban standards. The result is a funny, truly delightful show about nothing happening slowly in the verdant Japanese countryside. 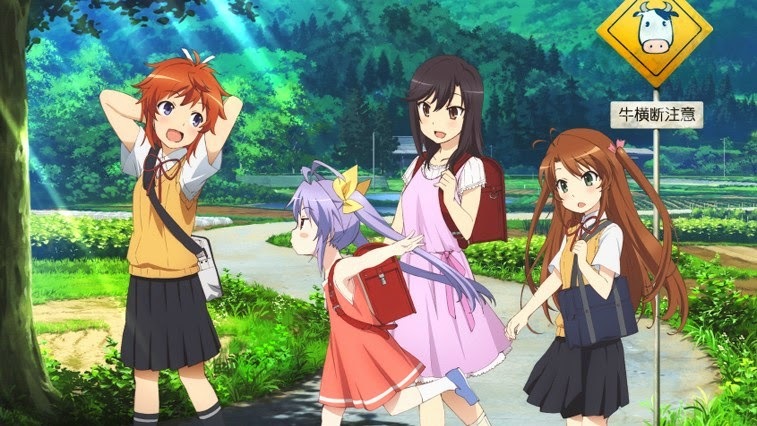 Non Non Biyori is currently streaming on Crunchyroll.